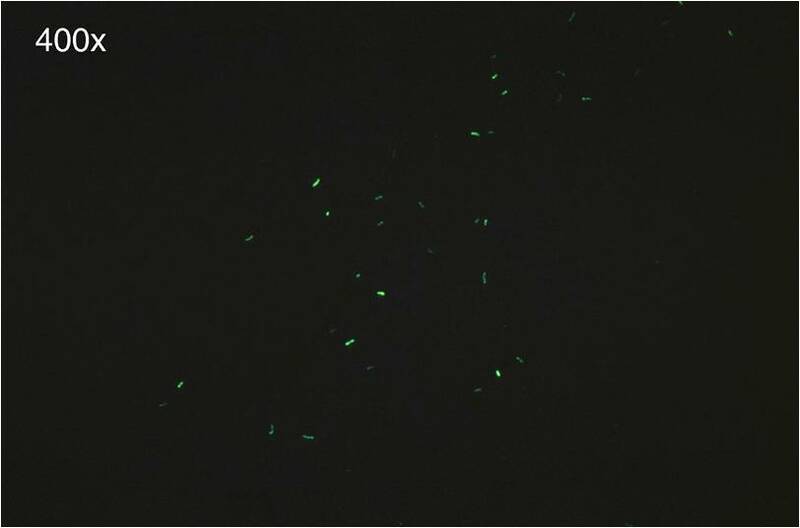 Auramine-Rhodamine Fluorochrome staining also known as “Truant method of staining”, is used to visualize Acid fast bacilli (AFB). Ziehl-Neelsen (hot), Kinyoun (cold) are still widely used methods in developing countries. CDC recommends fluorochrome staining for detecting AFB in primary patient specimens. The acid fastness of Mycobacteria is due to their thick cell wall composed of waxes and lipids that have a high content of mycolic acid. Fluorescent dyes like Auramine-Rhodamine binds to the mycolic acid present in them and impart bright yellow or orange fluorescence against a greenish background when viewed using a fluorescent microscope. It is also used to stain all Acid fast organisms including the sporozoan parasites. The fluorochrome dye, Auramine-Rhodamine, forms a complex with mycolic acids found in the acid-fast cell wall of organisms which resist decolorization by acid-alcohol.The counterstain, potassium permanganate, renders tissue and its debris nonfluorescent, thus reducing the possibility of artifacts. The cells visualized under ultraviolet light appear bright yellow or reddish orange. Slide: use only new, unscratched, and clean slides; using old, scratched, or dirty slides can lead to erroneous results. Identifier: Properly label each slide using graphite pencils or use a diamond or tungsten carbide stylus. For Sputum : Using a piece of stick, transfer a purulent part of the sputum (containing any yellow caseous material), to a slide and make a thin smear. An area of approximately ½ by 1 inch (or 2-cm square) is recommended.Spread the smear using circular movements. Allow to air dry. Note: Be sure to prepare smears of suitable thickness. Smears that are too thick may flake during staining and may be difficult to decolorize. Acid-fast organisms that might be present may be obscured. 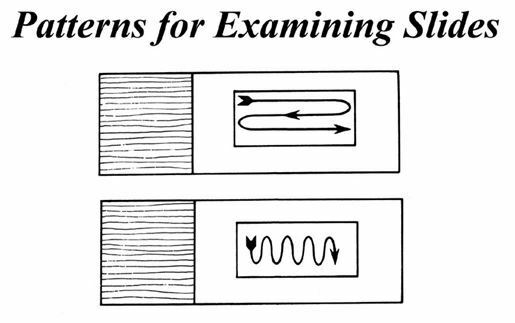 Smears that are too thin may not contain enough sample. Either condition–too thick or too thin–can lead to erroneous results, particularly false negatives. Here (image 1) the smear in the center is of the proper thickness. Hold a smear about 3 to 4 inches over news-print, if you are just able to read the print, the smear is of proper thickness. For Urine: Make a smear of the deposit from three centrifuged early morning urine sediments. Allow to air dry and heat fix the specimen. Use of an electric slide warmer is usually the preferred method for heat-fixing smears. 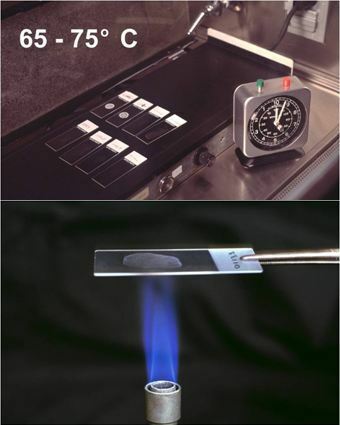 An alternate method of heat-fixing is to pass the dried slide, smear facing upward, 2 to 3 times through the blue cone of a burner flame. Place the fixed smear on a staining rack and flood slide with rhodamine-auramine for 15 minutes. Do not let surface dry. (Note: Fluorochrome dyes used for acid-fast staining include Auramine O, and Auramine O in combination with another fluorochrome, Rhodamine B). Wash off the stain with distilled water. Flood slide with fluorescent decolorizer (i.e acid-alcohol) for 2-3 minutes. Flood slide with potassium permanganate for 3-4 minutes. Do not allow slide to dry. Rinse thoroughly with distilled water and air dry. Examine microscopically under the same light source as used for fluorescent microscopy (i.e. a K530 excitation filter and a BG 12 barrier or G-365 excitation filter and an LP 420 barrier filter). Slides can be screened on high power (400X) and verified under oil immersion. Positive Test – Acid-fast organisms fluoresce reddish-orange against a dark background. Negative Test – Non-acid-fast organisms will not fluoresce or may appear a pale yellow, quite distinct from the bright acid-fast organisms. The minimum number of fields to examine before reporting a smear as negative for acid-fast organisms. If no fluorescent rods are seen, report the smear as NO AFB seen. 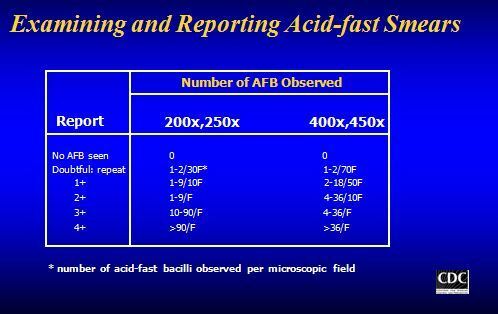 Faster screening of smears than with ZN- Smears can be examined rapidly using a 40x objective or 25x objective.This increases the chances of detecting AFB especially when they are few. No heat is required for staining. A positive staining reaction provides presumptive evidence of the presence of mycobacteria. 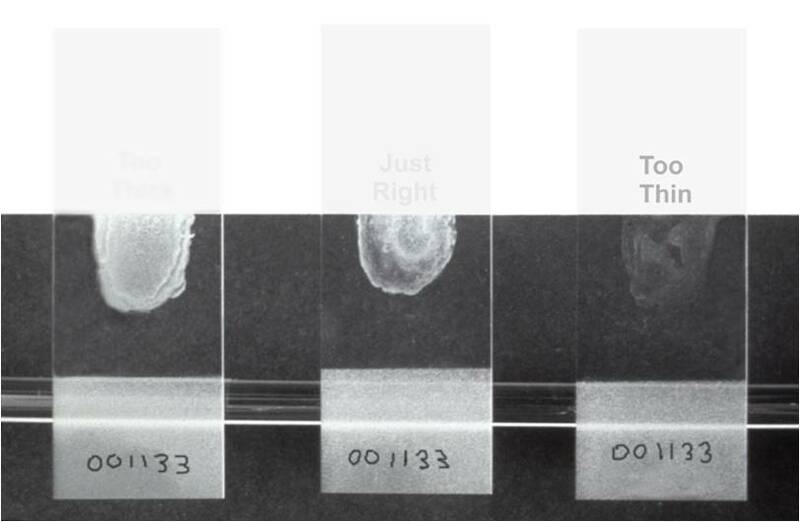 A negative staining reaction does not indicate that the specimen will be culturally negative. Therefore, cultural methods must be employed. Reagents like Auramine-Rhodamine are possible carcinogen, Acid –alcoholand Potassium permanganate is also strong irritant to skin, eyes and respiratory system. Caution is required while handling and staining using such reagents. Most strains of rapid growers may not appear fluorescent. 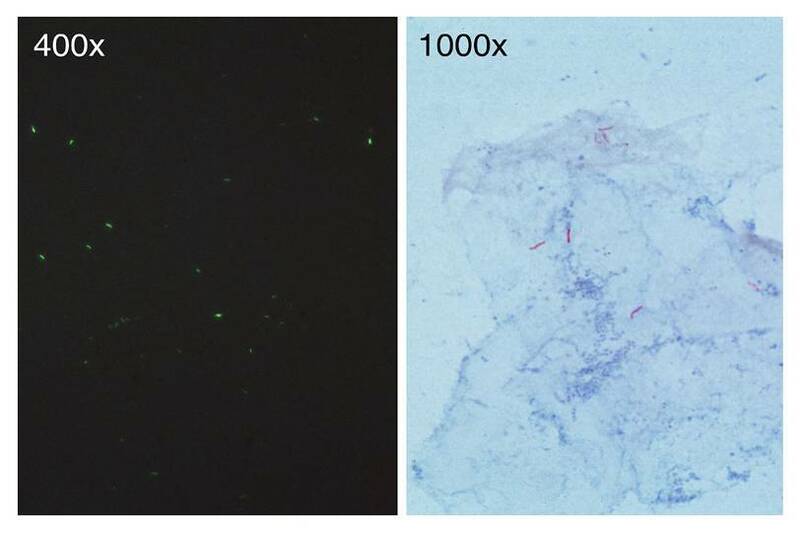 It is recommended that all negative fluorescent smears be confirmed with Ziehl-Neelsen stain; at least 100 fields should be examined before being reported as negative. Excessive exposure to the counterstain may result in a loss of brilliance of the fluorescing organism. Stained smears should be observed within 24 hours of staining because of the possibility of the fluorescence fading. Note: Most of the above images were reproduced from this PPT Slide of CDC. i kanakaprasad working as research assistant designed a stain for Mycobacteria same as ZN and Auramine which are not carcinogenic and without using phenol in stain study is finished yet to publish results and clarity is much more in our stains. I am a pathologist. I am using IF microscope for anti nuclear antibody testing. Can i use this microscope for AFB AURAMINE RHODAMINE STAIN? I am a student of MLT. I’m confused with enrichment media. How does it differ from selective media.what is the definition? Dear D.M. Wathukarge thank you for your comment. You can find differences between enrichment media and selective media in this blog post about bacteriologic media. Hello Tankeshwar, this is Pham Khan , iam South Sudanese medical laboratory technician , working in national public health laboratory as TB lab technician in bacteriology department . can you provide me with pure ,principle , procedure , And how to interpreted the Auramine fluorescent technique , when to revise the quality control from the slide which has been staining with auramine , which was from another lab .